Isaac Asimov (/ˈaɪzᵻk ˈæzᵻmɒv/; born Isaak Yudovich Ozimov; circa Januar 2, 1920 – Aprile 6, 1992) wis an American author an professor o biochemistry at Boston Varsity, best kent for his wirks o science feection an for his popular science beuks. Asimov wis a proleefic writer that wrote or eeditit mair nor 500 beuks an an estimatit 90,000 letters an postcairds. [lower-alpha 1] His beuks hae been published in 9 o the 10 major categories o the Dewey Decimal Clessification. Asimov wrote haurd science feection. Alang wi Robert A. Heinlein an Arthur C. Clarke, Asimov wis conseedert ane o the "Big Three" science feection writers in his lifetime. Asimov's maist famous wark is the "Foundation" series; his ither major series are the "Galactic Empire" series an the Robot series. The Galactic Empire novelles are set in earlier history o the same feectional universe as the Foundation series. Later, wi Foundation and Earth (1986), he airtit this distant futur tae the Robot stories, creautin a unifee'd "future history" for his stories muckle lik thae pioneered bi Robert A. Heinlein an previously produced bi Cordwainer Smith an Poul Anderson. He wrote hunders o short stories, includin the social science feection novelette "Nightfall"; in 1964, it wis votit the best short science feection story o aw time bi the Science Fiction Writers of America. Asimov wrote the Lucky Starr series o juvenile science-feection novelles uisin the pen name Paul French. Asimov an aw wrote mysteries an fantasy, as weel as muckle nonfeection. Maist o his popular science beuks explain concepts in a historical wey, gaein as faur back as possible tae a time whan the science in quaisten wis at its semplest stage. Ensaumples include Guide to Science, the three-vollum set Understanding Physics, an Asimov's Chronology of Science and Discovery, as weel as warks on chemistry, astronomy, mathematics, history, an William Shakespeare's writins. He wis preses o the American Humanist Association. The asteroid 5020 Asimov, a crater on the planet Maurs, a Brooklyn primar schuil, an a leeterar awaird are named in his honour. ↑ Asimov, Stanley (1996). Yours, Isaac Asimov. My estimate is that Isaac received about 100,000 letters in his professional career. And with the compulsiveness that has to be a character trait of a writer of almost 500 books, he answered 90 percent of them. He answered mair than hauf wi postcairds an didna mak caurbons o them. But wi the 100,000 letters he received, thare are caurbons o about 45,000 that he wrote. ↑ 1.0 1.1 Asimov, Isaac. In Memory Yet Green. The date of my birth, as I celebrate it, was January 2, 1920. It could not have been later than that. It might, however, have been earlier. Allowing for the uncertainties of the times, of the lack of records, of the Jewish and Julian calendars, it might have been as early as October 4, 1919. There is, however, no way of finding out. My parents were always uncertain and it really doesn't matter. I celebrate January 2, 1920, so let it be. ↑ Pronunciation note: In the humorous poem "The Prime of Life" published in the anthology The Bicentennial Man and Other Stories, Asimov rhymes his name thusly: "Why, mazel tov, it's Asimov". 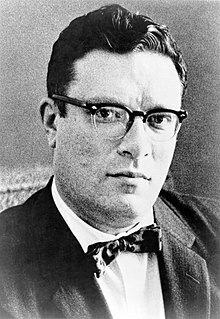 In his comments tae the poem, Asimov wrote that oreeginally it was "Why, stars above, it's Asimov", an when someone suggestit tae uise "mazel tov" insteid, Asimov acceptit this as a signeeficant impruivement. ↑ Seiler, Edward; Jenkins, John H. (June 27, 2008). "Isaac Asimov FAQ". Isaac Asimov Home Page. Retrieved July 2, 2008. ↑ "Isaac Asimov Biography and List of Works". Biblio.com. Retrieved March 5, 2008. ↑ Asimov, Isaac (1994). I. Asimov: A Memoir. New York: Doubleday. pp. 475–76. ISBN 0-385-41701-2. ↑ Asimov, Isaac (1994). I. Asimov: A Memoir. New York: Doubleday. p. 500. ISBN 0-385-41701-2. ↑ "USGS Gazetteer of Planetary Nomenclature, Mars: Asimov". Retrieved September 4, 2012. This page wis last eeditit on 5 November 2018, at 19:21.